The Town of North Hempstead Councilwoman Lee Seeman serves as 1 of the 21 members of the United States Commission for the Preservation of America’s Heritage Abroad. The commission works to restore cemeteries and other sites in America and foreign nations that are religiously, racially, or culturally connected to the heritage of U.S. citizens. Seeman spoke about a town located in central Poland called Serock when we met in her council office recently. As in hundreds of other cities, towns, and villages throughout Europe, Jews lived and built communities in the town of Serock since the Middle Ages. Throughout the centuries, Seeman explained, Jews buried their dead in a Jewish cemetery located in a meadow on the outskirts of the town. In 1941, two years after their invasion, the Nazis destroyed the cemetery. Typical of their satanic methods, the Nazis ploughed over the dirt under which the remains of five centuries of Jewish dead were buried and turned the gravestones containing their names into the grounds for walking paths, planks to shore the edges of a local river, building material to repair barns and houses that neighbored the cemetery or debris dispersed on the soil and streets of the town. And finally, the Nazis turned the entire terrain of the cemetery into a public park. I assumed that Seeman, who is Jewish, had first become acquainted with the tragic story of Serock, of which I myself prior to the research I conducted for our meeting was totally unaware, through her work with the commission. But rather, Seeman, who has served on the commission since she was appointed by then President Clinton in 1994, informed me she had initially learned about Serock by chance, through a conversation with then-New York Congressman Gary Ackerman back in 2006. That fateful conversation with Ackerman put Lee Seeman, the mother of four grown children and grandmother of seven, on a mission to rededicate the cemetery. She sought to accomplish this mission both through her association with the committee and her own private fundraising efforts. To raise these private funds, she told me, she spoke at synagogues and reached out to friends, family members, and many philanthropists she had met throughout the years. In total she collected more than $30,000 for the project. 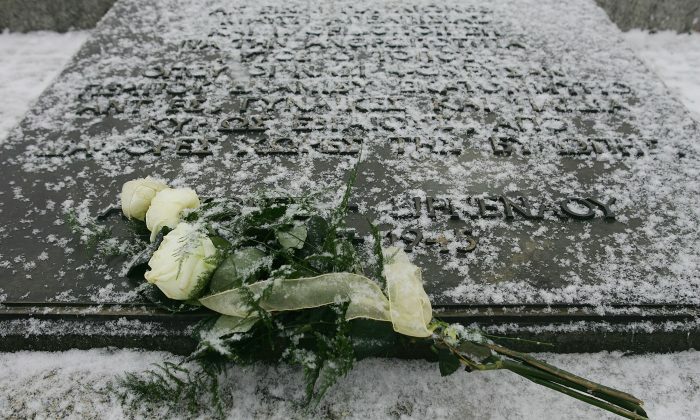 Seeman recalled that she was uplifted when she learned a few years ago that several Serock locals were retrieving partially composed headstones, which almost seven decades after the Holocaust, could still be found in the town. She elaborated that these locals, in the name and spirit of the rededication project, placed the tombstones, about 30 in all out of the tens of thousands that had been totally destroyed, along symmetrical rows stretched on a small hill located on the outskirts of the town. On Aug. 27, not long after the first tombstones were found and approximately eight years after Seeman had first learned about Serock, the rededication ceremony became a reality. She recalled that a small contingent of about 20 guests, all from Poland and America, joined her that day as she stood near the parcels of the sacred ground that had once been the Jewish cemetery of Serock. Among the mourners who came to honor the dead of Serock that day, I learned, were some especially remarkable people: an American woman named Dina Albert, who was born Doba Drezner in Serock more than 80 years ago; a very old Polish man—accompanied to the ceremony that day by his two daughters and their husbands—named Stanislaw Gasioirwsk, whose Christian parents risked their lives and the lives of their entire family by hiding Doba, then a teenager, and five other Jews from the Nazis; and also, there was Doba’s (Dina’s) granddaughter, 16-year-old Hannah Champness, who as her bat mitzvah project raised some of the funds used to build the monument that would be unveiled that day. Lee Seeman, representing the commission, and Hannah Champness, representing the descendants of Serock Jews, addressed the gathering that day, as did Monika Krawczyk of the Foundation for the Preservation of Jewish Heritage in Poland; Zbigniew Jagetto president of the Board of PKO of (the Polish) Bank Polski; and U.S. Ambassador Stephen Mull. Seeman told me that while each used different words, she believed their message was the same. “We all offered a message of respect for the memory of those from past generations whose graves were desecrated and destroyed; a message of mourning for the six million victims of the Holocaust and the message of the belief in universal Jewish values, which include love, prayer and hope for the living and eternal respect and prayer for the dead,” said Seeman.